There are six main types. Many players ask which is the best. If you have enough patience, then make one of each. But which one should we choose if you are like most people and only want one? That would be the Ancestor's Warbow. Why? Because it deals steady and outstanding damage against any boss as no boss is fully resistant or immune against Physical damage yet. Some say that most late-game bosses are weak against Ice, which is why many opt for using an ice weapon. There's nothing wrong in that as an ice weapon deals more damage in the current late game. But the late game as we see it now won't always be THE late game. There are currently a few powerful dragons which are weak against ice. But what happens when the game is updated and bosses resistant against Ice appear? 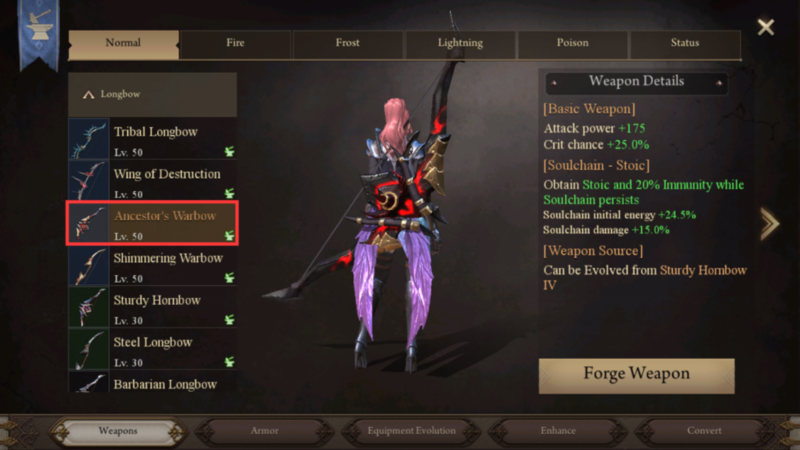 So, unless you have decided on a long-term goal of making several bows, I would recommend sticking to a Physical crit bow instead of an elemental one. And this should be true for most players out there. Of course, some enjoy bows that apply status effects such as paralyze. There's good fun in acting as a supporting damage dealer as well. Oh and by the way, weapons can currently be upgraded to level 95. Each Evolve increases the cap by 5, and after 70 each Evolve increases the cap by 1. There are many equipment setups that work, and here are some of the most commonly used sets. This is the most used set for archers at the moment. The 20 points of Precision it grants greatly increases your chance to crit. It also makes reaching 30 Merciless rather easy, and the same goes for Savagery. Which makes this set one of the best for pure damage. It however, lacks somewhat in leaper and rolls. In late game, dragons use many skills that are difficult to dodge, but that can be remedied with experience. And then there is aggro. I recommend you to get a ring with Taunt -1. The Goros set comes with very high base damage. Torrent is a S skill that is often overlooked. I've used Torrent at skill level 10 myself and it takes away all of your Stamina worries. You can basically charge up attacks and roll to your heart's content. A shortcoming of the Goros Set is your long resurrection time. But its merits far outweigh that, right? Those of you that have read up on different sets realize that this set is missing something, that's right, it doesn't come with any Merciless or Savagery at all. This has to be remedied by socketing wild souls, and from rings, and horses. So, if you choose this set but also want these two highly sought-after S Skills, then be prepared to work for it. The Saphros come with great S Skills. Both Savagery and Precision are very good for crit builds. And Skilled is great for reducing your skill cooldowns. However, this set lacks Merciless, which should probably be remedied by your horse, rings and socketed wild souls. Otherwise your damage will be somewhat lacking. If you have a good understanding of sets, you can choose to mix set pieces together to create your own setup. This makes it possible to avoid negative S Skills but this also means that your horse, ring and wild soul requirements are rather high. Unless you are careful, you might end up lacking in many S Skills. Crit damage > attack power/elemental attack power > crit chance. As for empowerment, if you're rich you can just do as you want, but most players should probably try their luck and empower around 20 times. If the stats you get are terrible, you can always try again for better results. Rings are mainly used to supply you with further S Skill points. Currently, archers tend to use The Punisher and Ring of Brambles. Use rings to increase the S Skills you are lacking. Under normal circumstances, get rings which have at least one basic S Skill and two random ones which fit your build. I would recommend leaving your horse for last. You can do this after you have all of your equipment, rings, titles, and socketed wild souls planned and ready. That's because horses are fairly expensive, and that remains true whether you train one yourself or buy it from the market. Besides, getting the right one is all just down to luck. Usually, runes that you unlock later on are stronger, and that holds true for all Longbow runes. For your first skill, use Lacerate or Explosive. For your second skill, use Revitalize or Concussion. For your third skill, use Swarm. Players always ask which is the strongest wild soul. But in reality, all wild souls are good, it is just a matter of which one you think suits you. For example, Tiamat - The Dragon Mother and Terra - The Earth Warden enables you to deal high damage when you activate them. However, if you have used your Last Stand, then you'll worry whether you'll be attacked by a behemoth; after all, you cannot deal damage when dead. And as for Melaina - The Sleeper and Deva - Goddess of Deceit, they both have passive skill bonuses which grant decent attack power and chance to crit, which is why they are sought after by many a Ranger. As can be seen from the above examples, most rangers tend to focus on attack-oriented wild souls. Does that make all other wild souls bad? Just think about it. Isn't it extremely useful when, as you are awaiting death, you get healed by a teammate's wild soul skill? Or if when you've been knocked down and the behemoth circles you, your teammate uses Void Zone and rescues you? Which is to say, all wild souls are strong, it all depends on how you use them. That's it for the Longbow strategy guide. I hope it will be of help to both new and old rangers alike.